Business Hours: 4pm-2am (kitchen last call is 11.45pm). SINCE it opened in mid-2014, the Thirsty Monkeys Cafe and Bistro has built a loyal following. 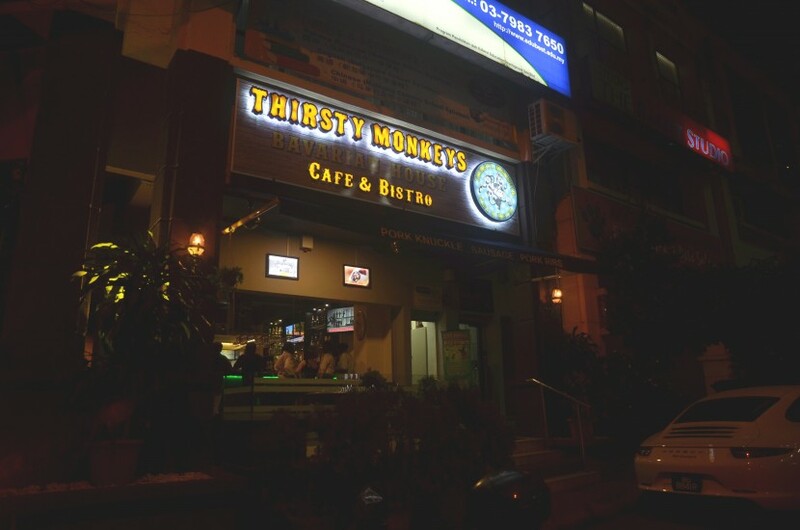 Located in a corner of the busy Taman Desa Business Park neighbourhood, the name “Thirsty Monkey” came about because Adrin Colin, A. Surendran and T. Adrian were all born in the Year of the Monkey, according to the Chinese zodiac. The exterior of Thirsty Monkeys. “And we all like to drink,” chuckled Adrin, who explained that after taking over from the previous operators, the new owners wanted to introduce a more “fusion”, family-friendly menu. Of course, keeping to the Bavarian theme of the establishment, you have an ample list of German beers on tap, and quite an extensive selection of wines too. In terms of the food, this is seriously a pork lover’s idea of heaven, but there is something for everybody here. The menu has been kept relatively simple and there is also an Asian selection for those who are not keen on sauerkraut. 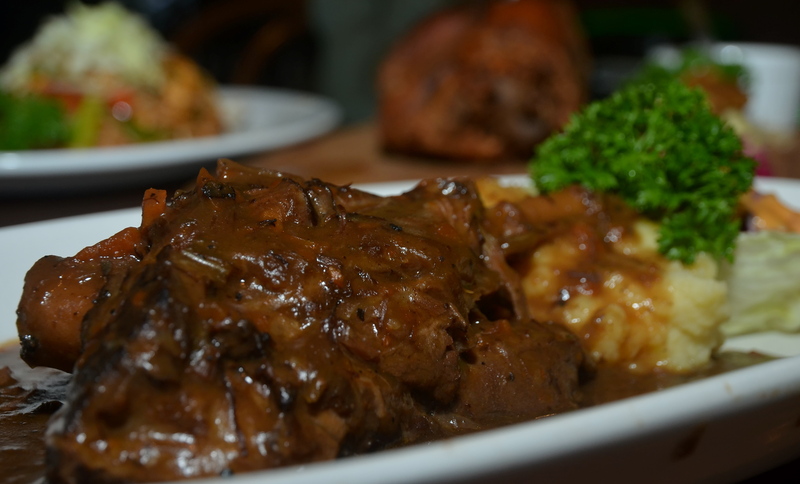 The Braised Lamb Shank is a crowd favourite. One of the establishment’s main attractions is its Braised Lamb Shank, where the meat is cooked till “fall-off-the-bone” tender. Meanwhile, the creamy mashed potato side serves to mop up any remaining stew sauce and the salad side completes the dish as a meal on its own. Groups looking to dine here can check out dishes such as Thirsty Monkey’s Pork Ribs and Sausage Set platter (top pic). Drenched in savoury-sweet and slightly spicy barbecue sauce, Thirsty Monkey’s Pork Ribs just needs a slight push with the knife to separate the meat from the bones. The former, swimming in a puddle of sweet-savoury and slightly spicy barbecue sauce, just needs a slight push with the knife to separate the meat from the bones. 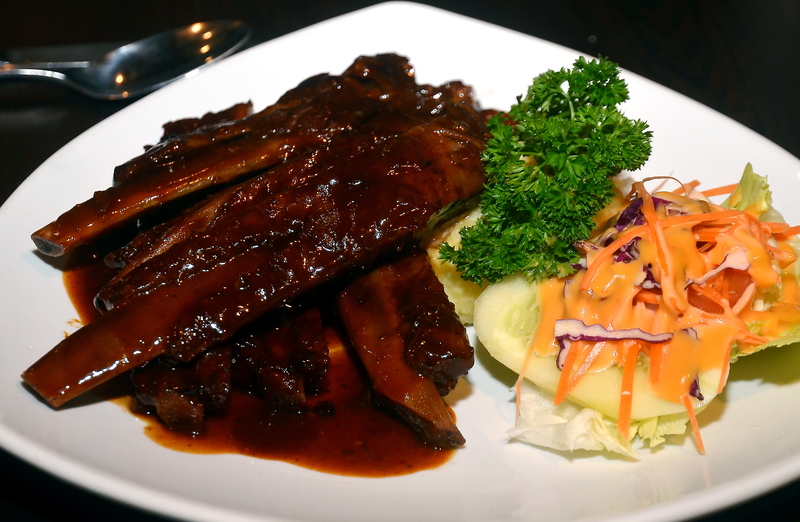 The ribs seem to be a crowd favourite too, as one observed some patrons ordering another plate just after polishing off one set. Meanwhile, the Sausage Set consists of six huge sausages, topped off with strips of bacon. 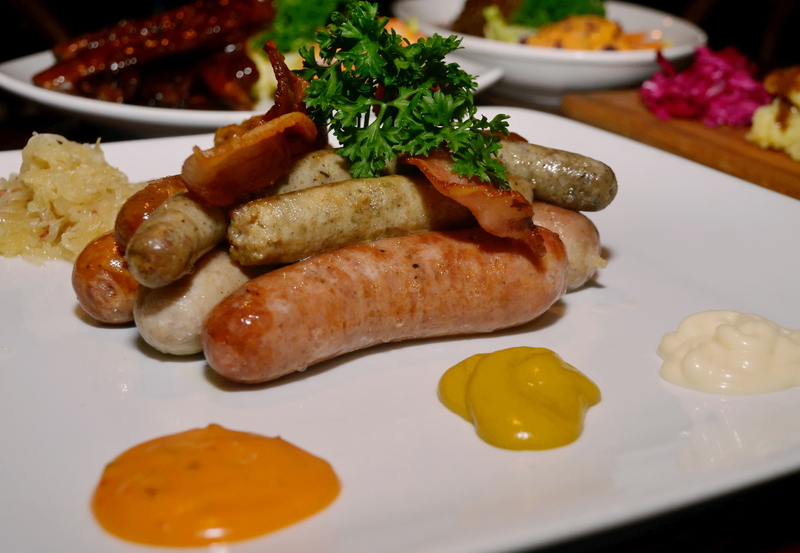 Served with sauerkraut, chopped beets and mashed potato, you have chorizo, cheese-filled Emmanthaler, bratwurst and regional variations from Hungary, Nuremberg and Thuringia. A choice of three dips – spicy and garlic mayonnaise, or mustard – complete the dish. 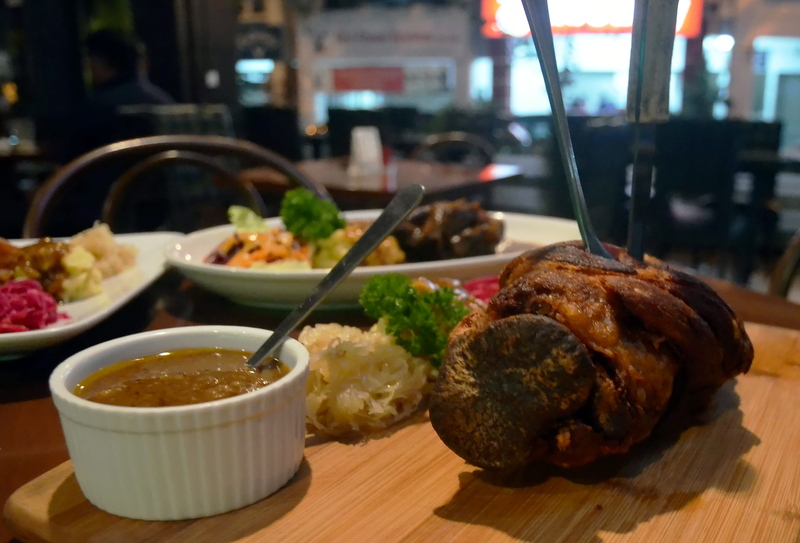 Thirsty Monkey’s Roast Pork Knuckle is served with slightly toned-down sauerkraut. The sauerkraut you get is mildly acidic, the taste has been modified for Malaysian palates, and it is served with Thirsty Monkey’s Pork Knuckle. Actually, the mild sourness goes well with the rich crispy skin, fat and roast flesh of the knuckle, which is enough for two or three people. 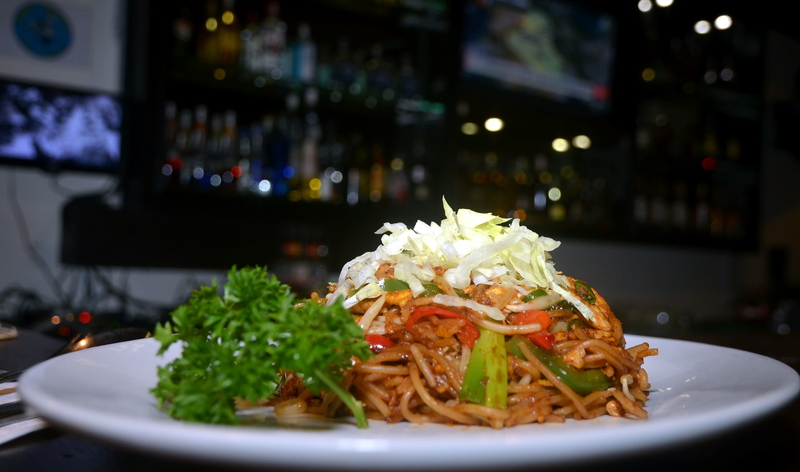 One non-Western dish this writer sampled was Thirsty Monkey Noodles, spaghetti tossed in green chilli slices with spring onion, chicken, prawn and capsicum. “Usually, diners ask us to make it spicier to get a better ‘kick’ ,” laughed Adrian, the partner with the most food and beverage industry experience, as this writer reached for his third glass of cold water. Although the place used to do lunch, Adrian explained that they were focusing on dinner service, but there are plans to resume lunch once they have enough manpower. One thing nice about this place is that it only charges GST – there’s no service charge! This is the writer’s own observation and not an endorsement by StarMetro.